Catherine Leonard and Hugh Tinney. A SUNDAY afternoon with Brahms, and a lunchtime show, also involving Brahms, along with Bach and others, await classical music lovers, with two Music For Galway shows taking place over the coming days. 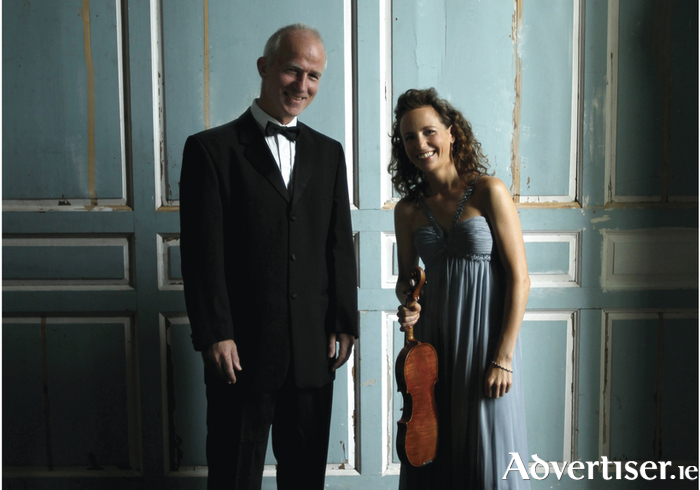 Sunday Afternoon With Brahms will see Catherine Leonard (violin ) and Hugh Tinney (piano ), make a long overdue Galway début, in the Aula Maxima, NUI Galway, on Sunday February 12 at 3pm. The programme features Brahms' Sonata No 3 in Dm Op 10, but also two movements from Bach's Sonata BWV 1017; Schubert's Sonata D385, Messiaen's Thème et Variations, and Raymonde Deane's Parthenia Violata. Tickets for this show are €18/14/6 through Music for Galway (091 - 705962, www.musicforgalway.ie ) or Opus 2, High Street. The event also doubles as the Music for Galway Friends’ Concert. Brahms and Bach also feature at the next concert, which will be a lunchtime show from Robert Solyom (clarinet ) and David Szabó (piano ), in the Hotel Meyrick on Thursday February 16 at 1.05pm. Solyom and Szabó are teachers at Maoin Cheoil na Gaillimhe. The programme will be Liszt’s Transcendental Etude for Piano No 10; Brahms’ beautiful late work, the Sonata for Clarinet and Piano Op 120 No 2; as well as Bach's Prelude for Piano in Bm and Von Weber's Concertino for Clarinet and Piano in Eb. Tickets are €7 while a concert, soup, and sandwich combo is €14. Booking is via [email protected] or 091 - 705962.